You can use the find command and other options as follows. The -s option to the test builtin check to see if FILE exists and has a size greater than zero. It returns true and false values to indicate that file is empty or has some data. 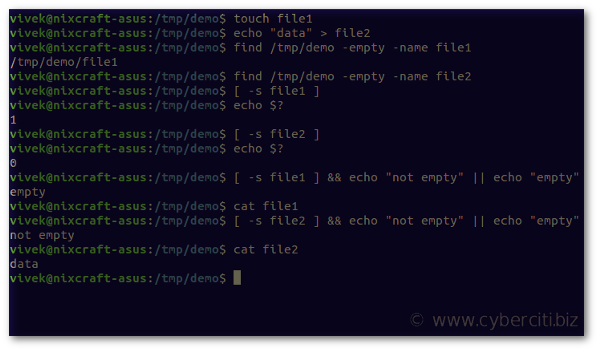 This page shows how to check if a file is empty in Bash shell running on a Linux or Unix-like operating systems. You should not see any output from the find command. [ -s /tmp/f1 ] echo $? The non zero output indicate that file is empty. The zero output indicate that file is not empty. So you can write a shell script as follows. This page showed how to check if file is empty on a Linux or Unix-like operating systems using various commands. See test command for more info.